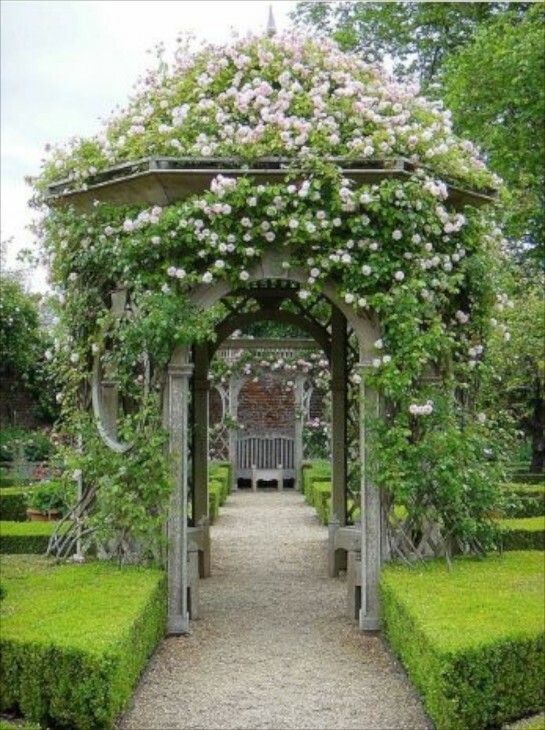 A gazebo is a small building, usually in a garden, with a good view. This word, gazebo, is surrounded by more mystery than an earnest etymologist would like. It appears in 1752 without any warning or antecedent in part four of a book by William and John Halfpenny with the title New Designs for Chinese Temples, an influential work that was aimed at the then new English fashion for the oriental in design and architecture. Little is known about William Halfpenny, who called himself an architect and carpenter, not even if this was his real name (another architectural writer of the period, Batty Langley, said he was actually called Michael Hoare), nor whether his collaborator John Halfpenny was his son, as some have assumed, or even existed. The word gazebo is equally mysterious. A lot of people have assumed that — like the temples described in the book — it must be of oriental origin. If it is, nobody has found its source. Failing that, etymologists make an educated guess that he named the structure tongue-in-cheek, taking the ending -ebo from the Latin future tense and adding it to gaze, so making a hybrid word that might mean “I will look”. If true, the model was probably videbo, “I shall see”, or perhaps lavabo, literally “I will wash”, taken from the Latin mass of the Roman Catholic Church to refer to the towel or basin used in the ritual washing of the celebrant’s hands. Let’s look at some examples, and when covered, it is with the rose. 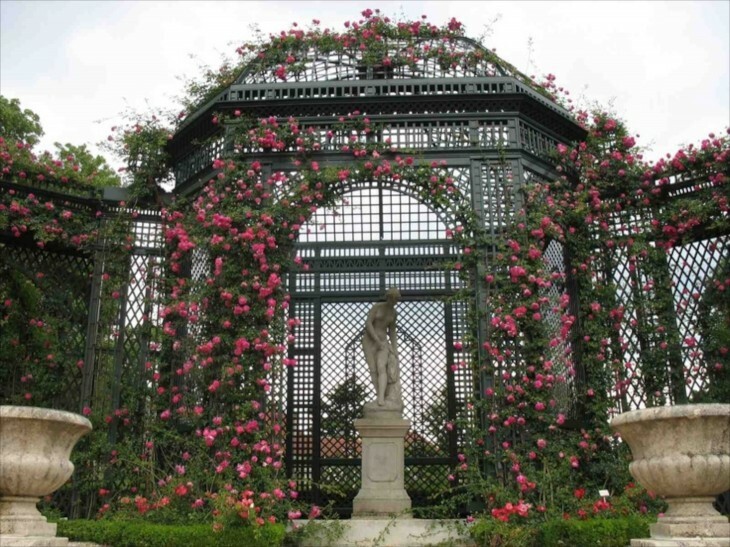 In Victorian days, these were often referred to as Rose Pavilions. This one is unadorned, but is a good structural example. Lovely by the lake, it would be delightful if covered in vines or roses. 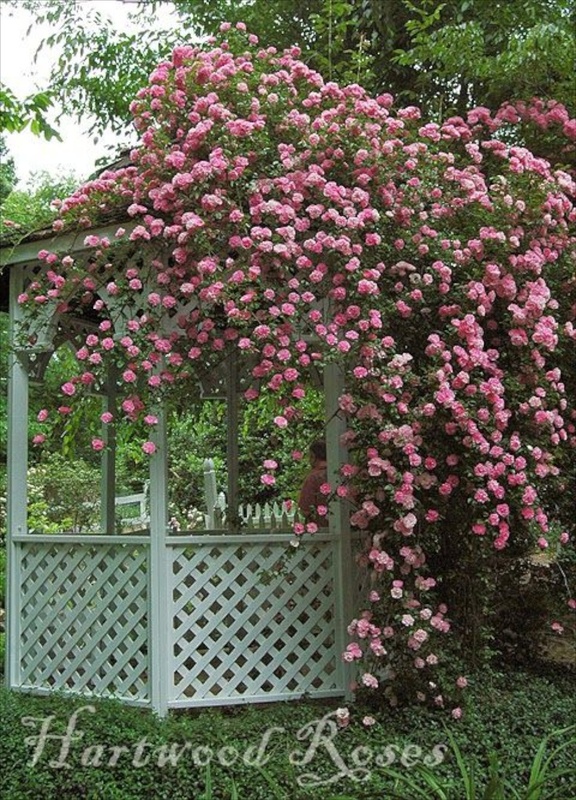 This one is also not covered, but potted flowers around the base give it an inviting appeal. 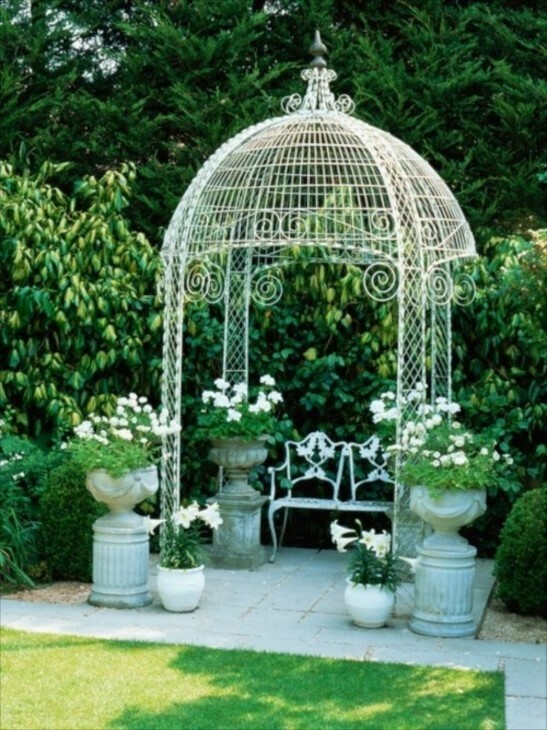 I like everything about this gazebo. 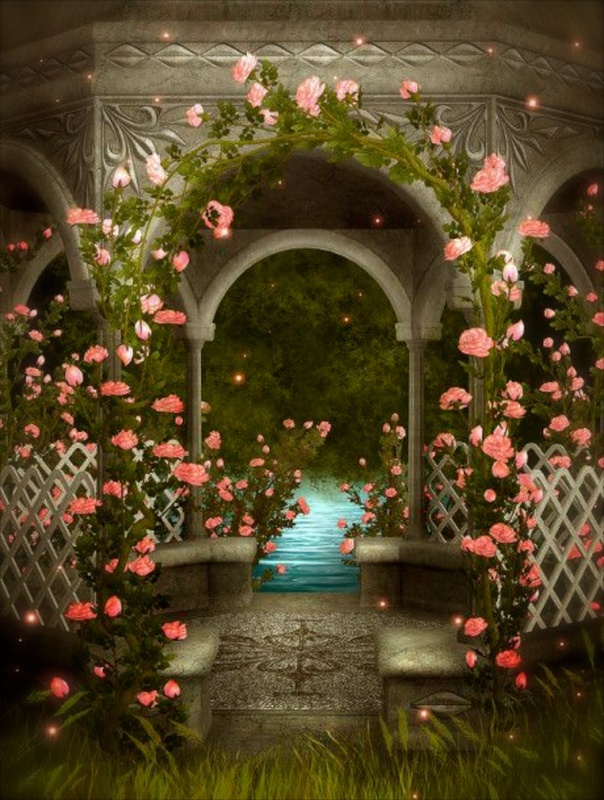 It not only serves the roses, but also provides an invitation to what lies beyond. 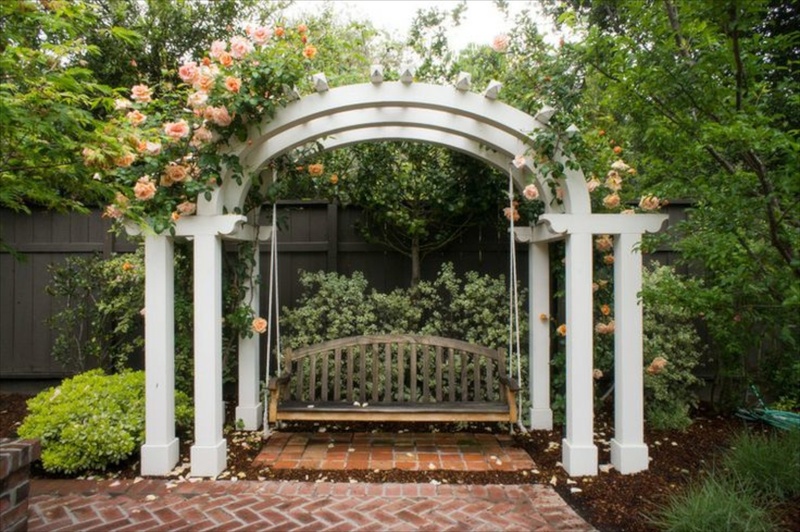 This gazebo provides the central focal point in the garden. 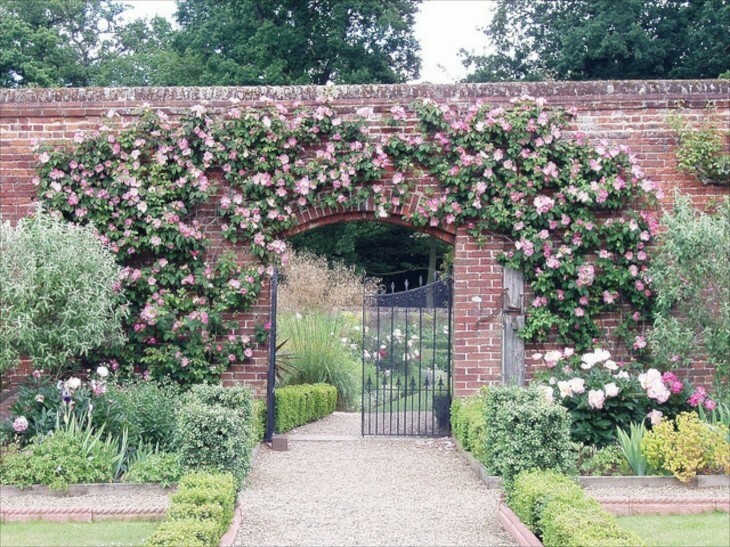 It is romantic the way the roses are so full as to cascade down the side. 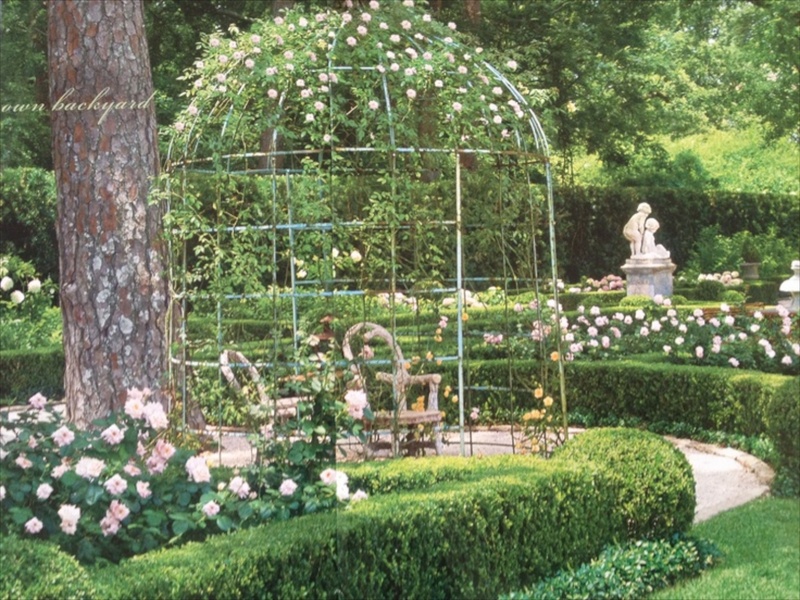 The tightly trimmed boxwoods repeat the circular pattern beyond. 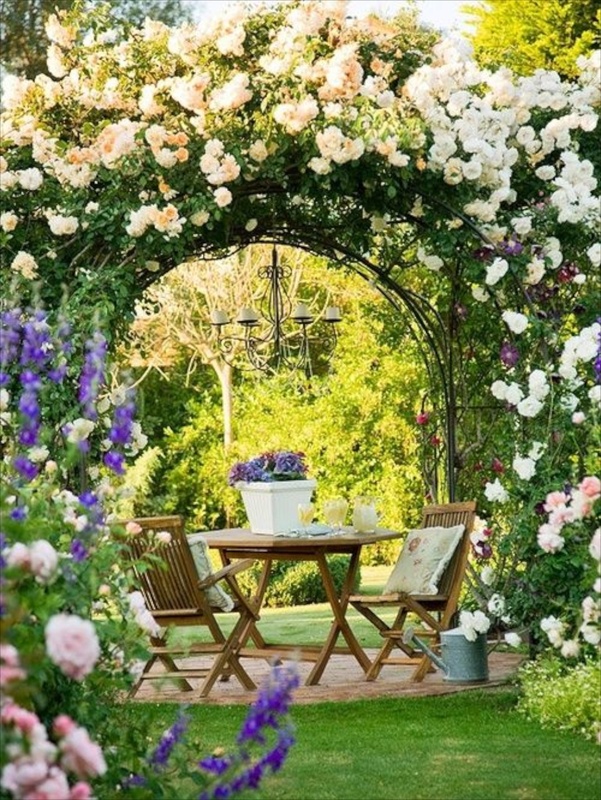 One would be hard put to not continue through this example to the additional seating in the garden beyond. This structure is cast of concrete, which allows for the beautiful scroll details in the posts. Notice the round opening to the left. Here again we see trimmed boxwoods. 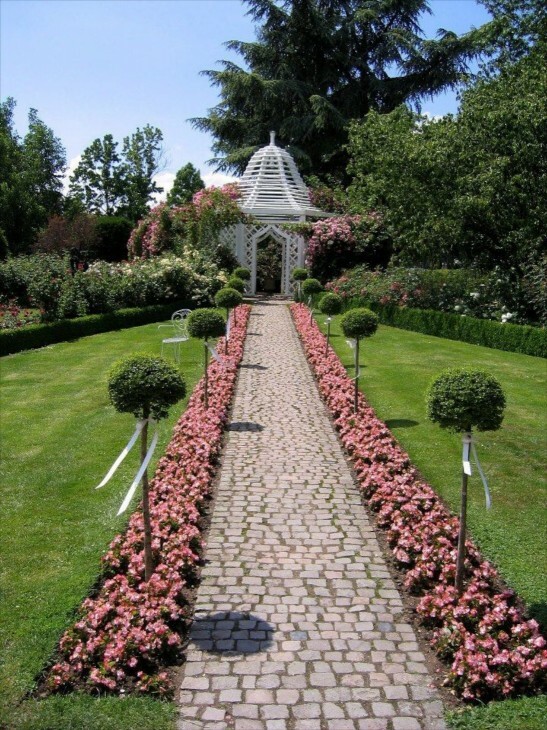 The crunch of the gravel beneath ones feet in gardens like these add another dimension of romance. What a gorgeous setting. 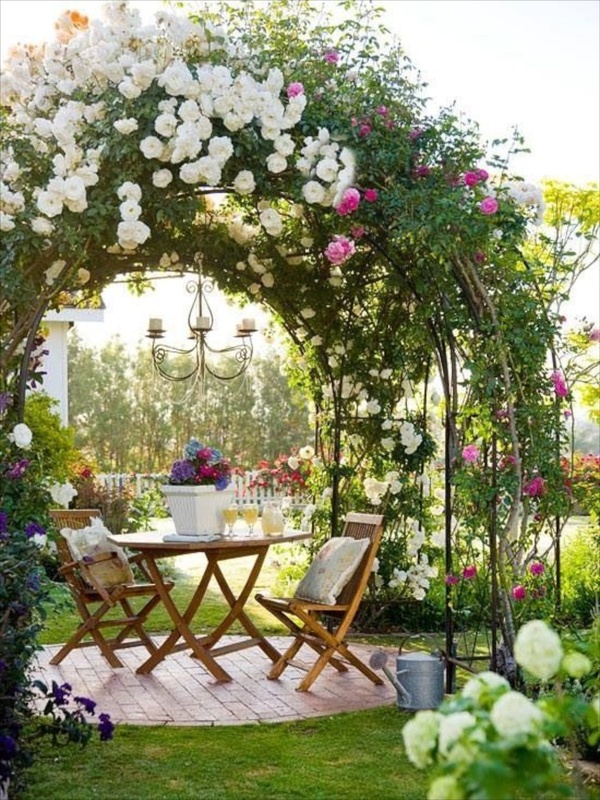 The chandelier adds romance and decor, while the roses turn the simple arch into living art. Another view of this beautiful summer setting. Here you can see the white picket fence beyond. 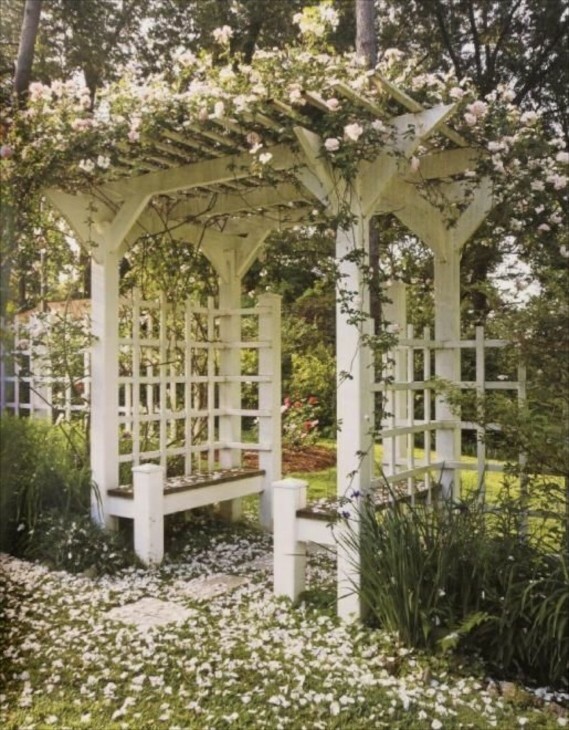 Not quite a gazebo, but even a rustic heavy wooden trellis like this can urge one to stop and literally take time to “smell the roses”. Another lovely example of a place in the garden that begs for enjoyment. 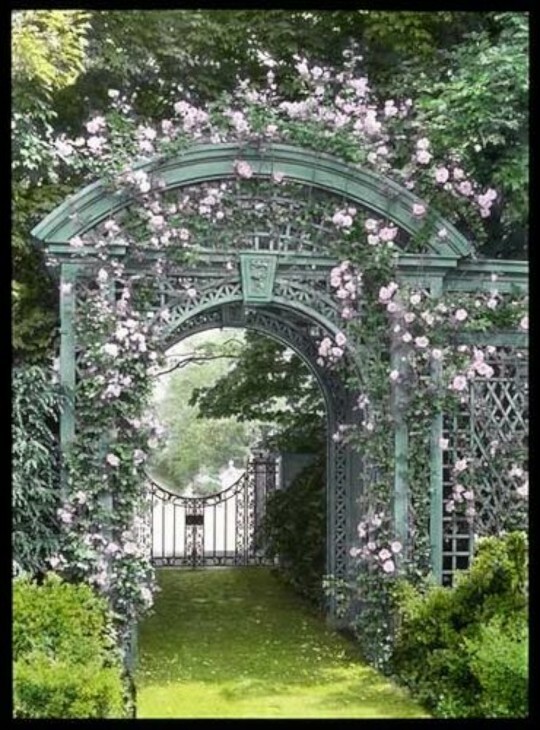 Rose petals on the grass add additional texture and maybe fragrance also. 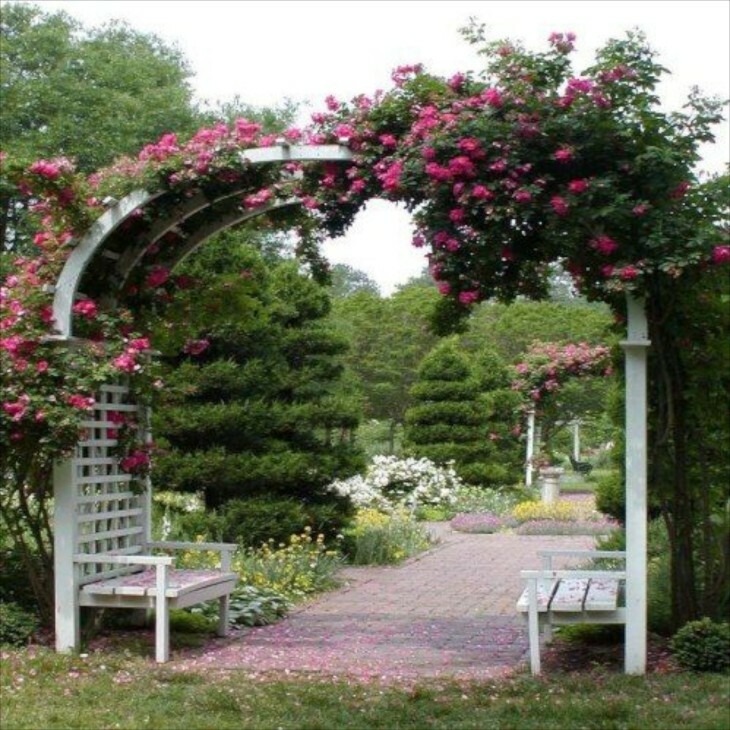 I am a lover of evergreens, and especially in rose gardens. This is beautiful. The first sitting area draws your eye right on to the next one. What a rose garden! 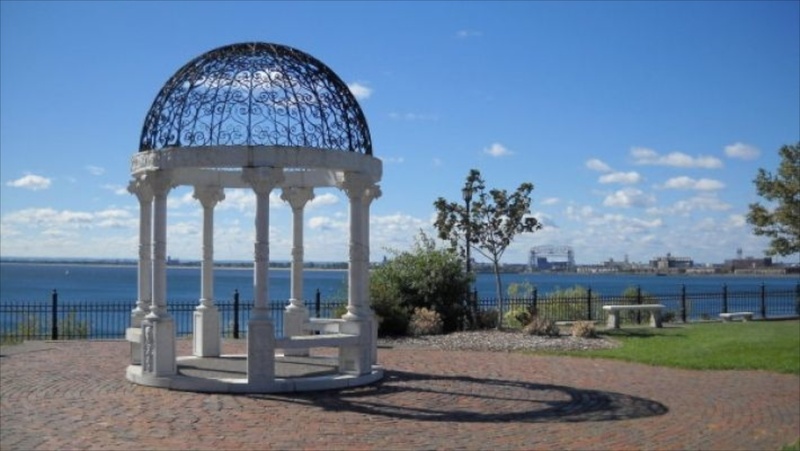 The gazebo with it’s dome top adds so much to this setting, and the blue color choice is a softer contrast to the flowers than the often seen black. 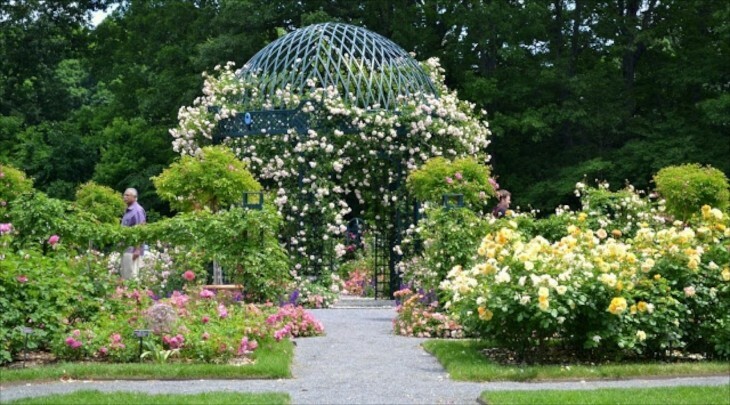 The dome top here is more intricate, and provides interest even when the roses do not completely inclose it. I like the cement columns….no painting! Here is one in a backyard garden featuring a swing. If this were in my garden I wouldn’t get a stick of weeding done, not a stick. This gazebo features an open roof, a bit different. This allows light to pour through the top to highlight the bronze statue. Quite Victorian, and it’s shape is so interesting and such that they have left part of it lacking rose coverage so one can appreciate both the flowers and the structure. In this rose garden, the gazebo provides structure, while the rose plants surround it, with boxwood providing a formal emphasis. 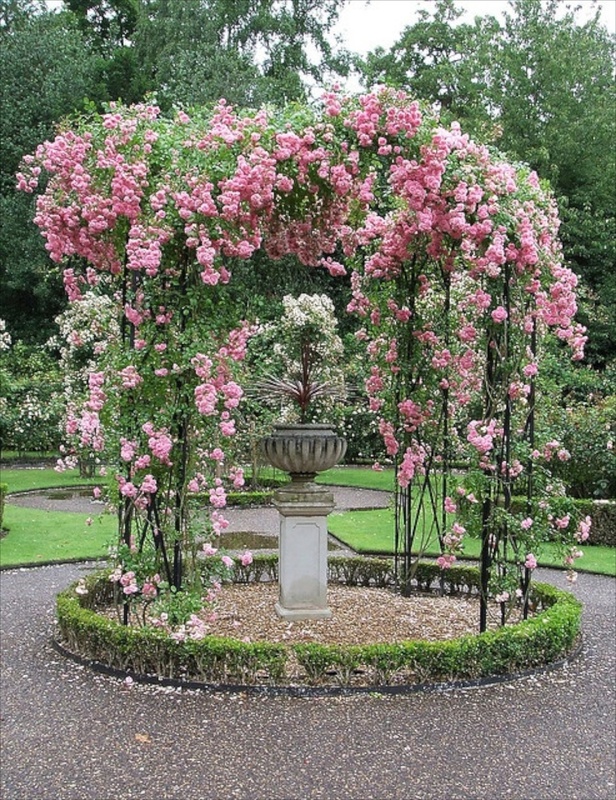 A less formal approach to a rose covered gazebo, but eye catching nonetheless. 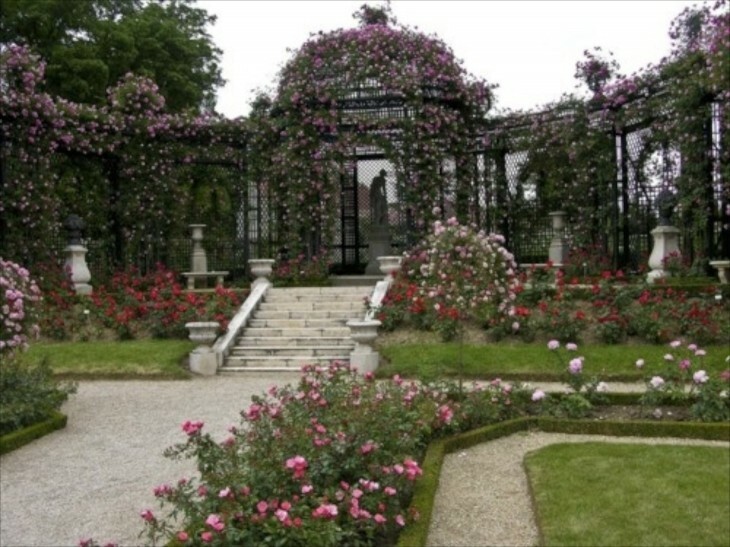 Formal, and an example of a rose covered structure in a rose garden. Viewed from a different angle. 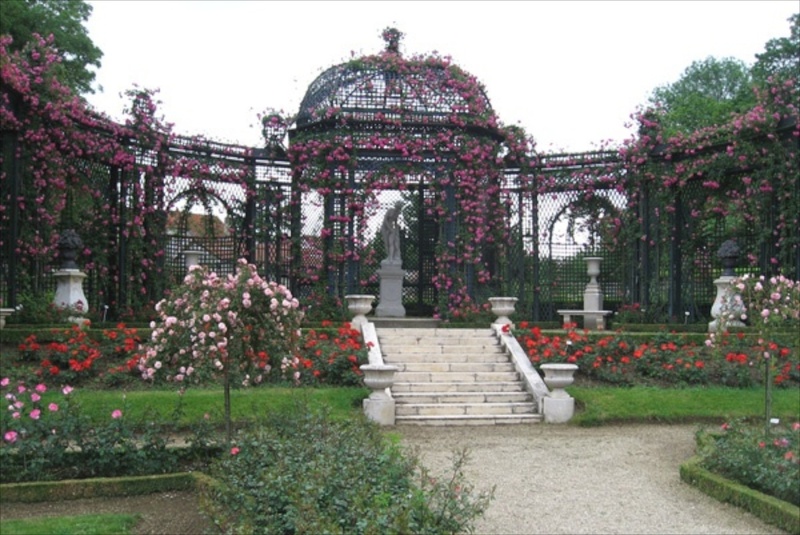 The roses also cover more of the structure than above photo. The roses in the foreground are also more in bloom. Although a garden wall and not a gazebo, I wanted to share with you how climbing roses on a wall add such visual charm and allure as to rival a gazebo. Here a charming gazebo in early spring unadorned for the moment except for the flowers on a neighboring tree. 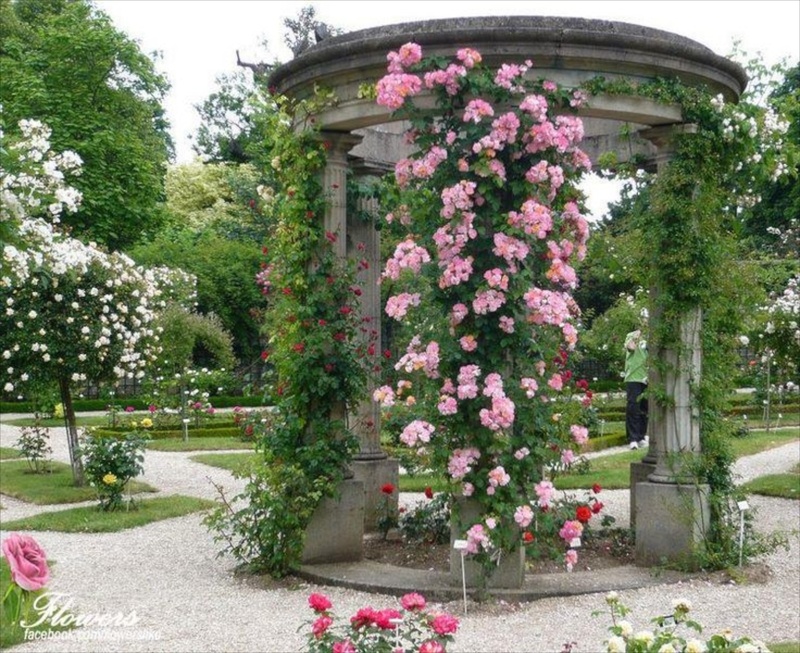 A close in view of the gazebo portion of the rose garden Roseraie du-Val-de-Marne. This one is painted a black green color and the rose flowers really pop against it. Gorgeous garden with this gazebo providing all the structure needed. By painting this one white, it draws the eye directly towards it instead of blending in as would a darker painted one. 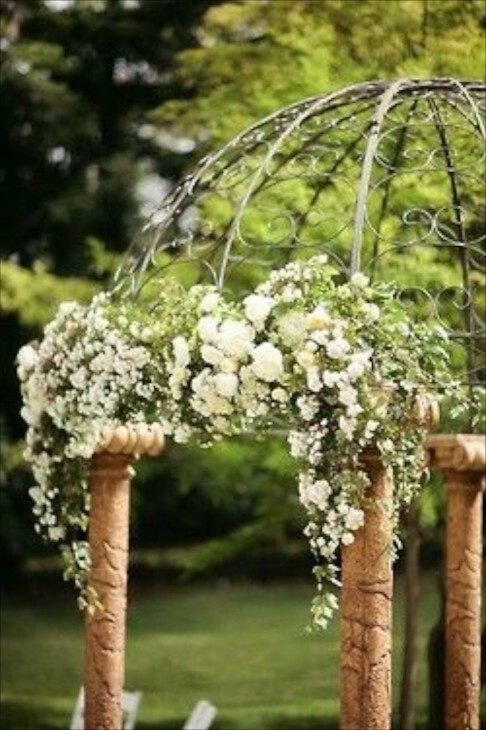 With the ribbons tied to the topiaries it looks like this one may be used for a wedding, as gazebos so often are. 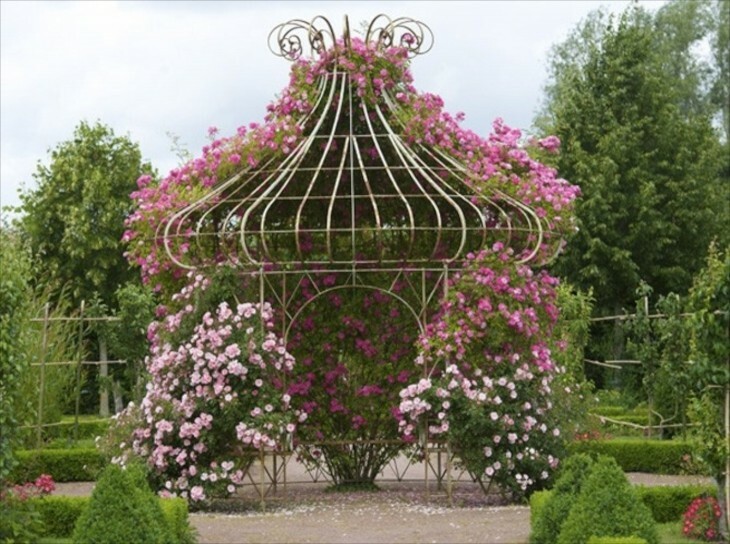 This gazebo appears more like a cage, with the roses contained only to the top where they will not obstruct the view into the rest of this gorgeous rose garden. Here again we see how evergreens provide not just fill, but needed visual weight to a balanced garden. 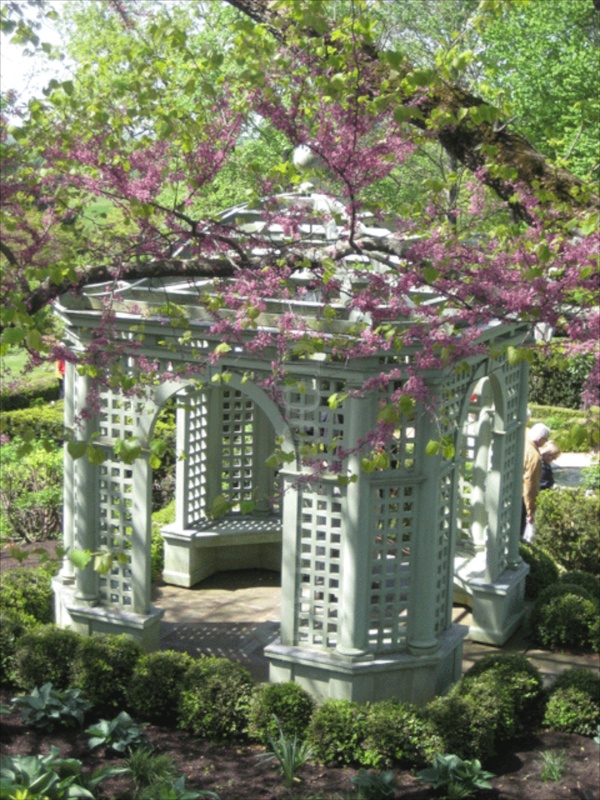 This gazebo is similar to one of the others shown above, with the top fully exposed. 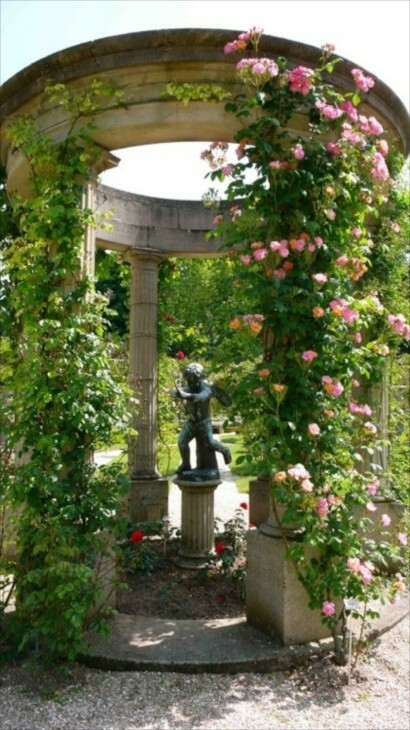 Here however, they planted a different variety of climbing rose on each column. 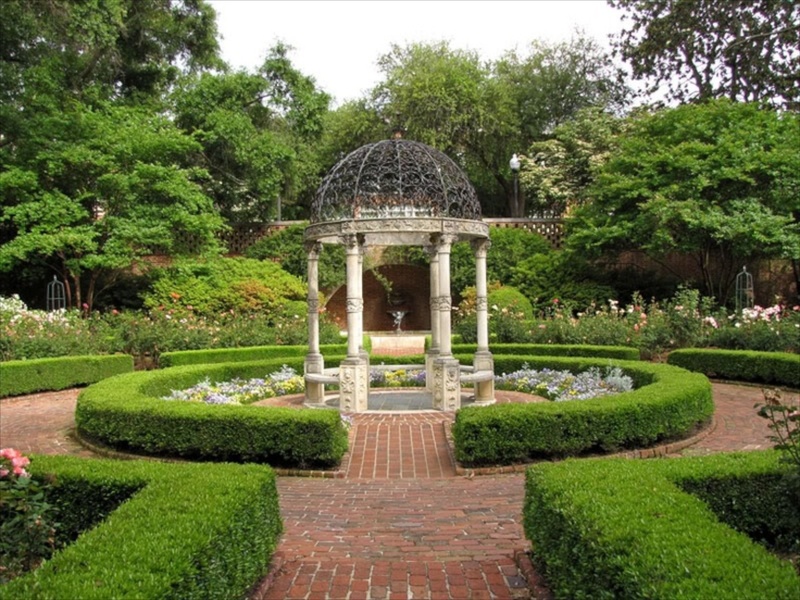 This garden has a very old European feel to it. I love how the light plays with the structure……. 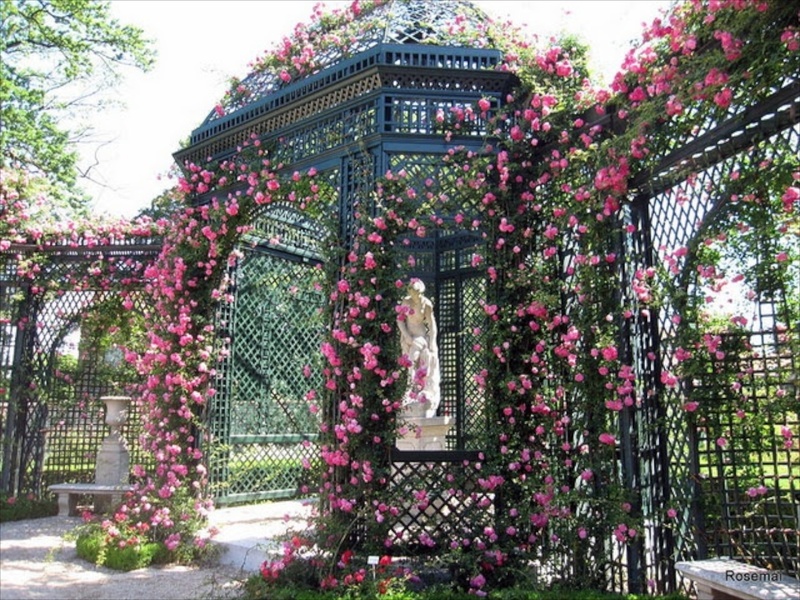 It is difficult to not look at these structures as anything but romantic. Many climbing roses have a lingering fragrance, and added to their placement in a large or small garden, they seem to serve as a additional catalyst for reflection. And isn’t that what gardens seem to nuture anyway? And if whimsy is more your bent, then grab some Chihuly glass and go from there! Gardening is all about your personality, so I say go for what makes you happiest. This one is right up my alley…….. I hope you enjoyed this. 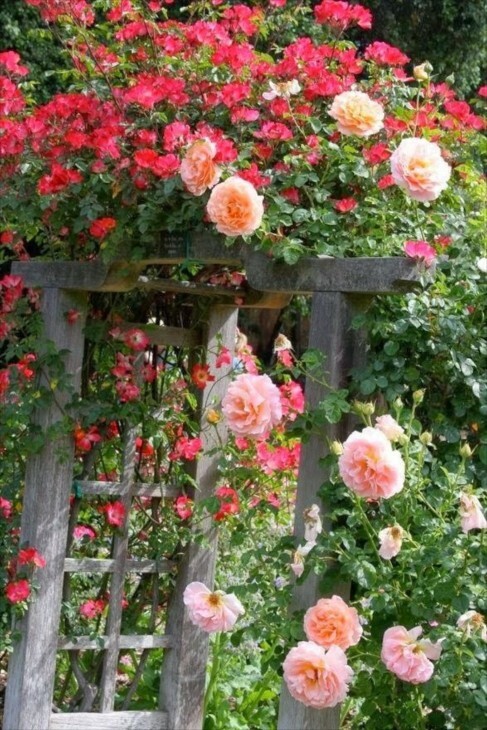 I love roses, and there are now climbing roses that are hardy enough to survive in most gardening zones, and that require enough care to be worth their while. rest in peace, RobinWilliams 1951-2014 , comic genius, actor. Absolutely breathtaking! I love this style of gardening. I love all things romantic! I cannot believe Robin is gone! So very sad. Beautiful words that you wrote. Funny how roses, almost more than any other flower, have come to be thought of as so romantic. Rose breeders have come up with some interesting varieties for sure. 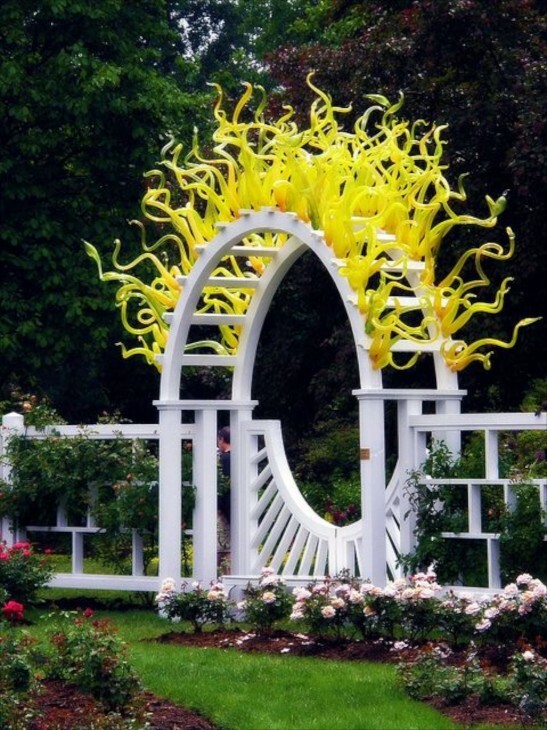 I was unable to locate the origin of the photo, but if it is in Missouri at the Botanical Gardens, then that is probably a Chihuly installation, as he has now completed many garden art installations. The balls in the pool make it almost a sure bet it is Chihuly. Love his work!